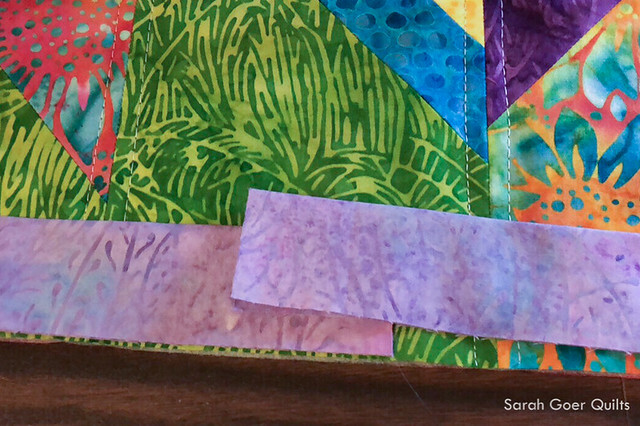 The products featured in this post were given to me by Island Batik, including products from Hobbs and Aurifil. Back to that multitasking that I mentioned. 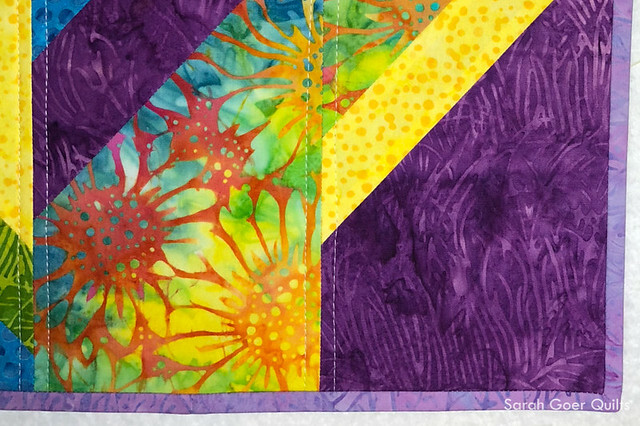 This mini quilt is my Project QUILTING Bold and Brave challenge quilt, my Island Batik Ambassador Mini Love project, and a class sample for my Planned Improv: All About Angles workshop. A three-fer! It finishes at 20.5" x 24", pieced and simply quilted with Aurifil white 50wt thread, and features Hobbs Thermore Ultra-Thin Polyester batting. I chose my binding from one of my Stash Builder rolls. 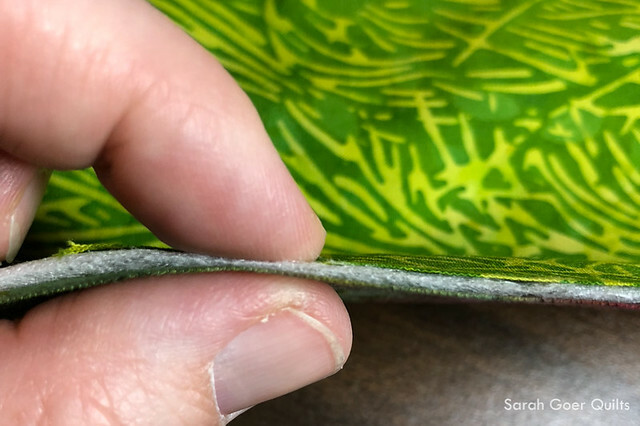 It was a 5" x WOF strip and I managed to make it work by piecing my binding with straight seams since I was worried I didn't have enough fabric to piece on an angle... and I was right! It was a very close call. I love mini quilts. They provide a great opportunity for a fast finish, an especially nice option for gifts. They can provide a splash of color on a wall or table. And mini quilts are my favorite way to try out a new technique. Something about their small size means it isn't too big of a commitment for a first run with a new skill. Posted in Quilting. 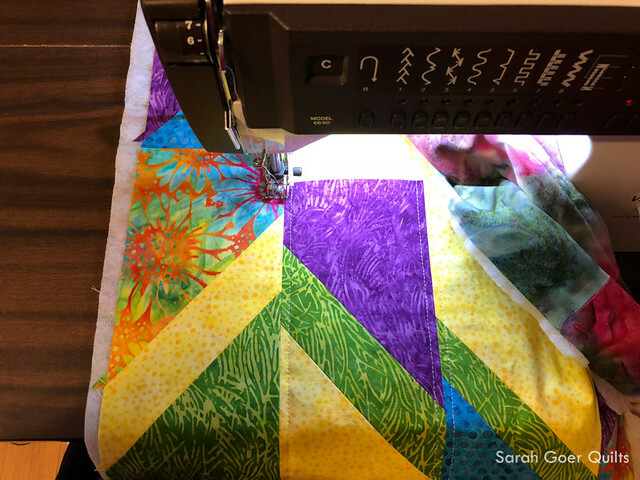 Tags: all about angles, Aurifil thread, Hobbs batting, Island Batik, Island Batik Ambassador, planned improv, Project QUILTING, Sarah Goer Quilts on February 11, 2018 by sarah. Wow, congratulations on being able to triple task on this finish! Right!? It almost feels like cheating. ;-) Thanks for visiting, Yvonne. Good job incorporating so many things in one project! 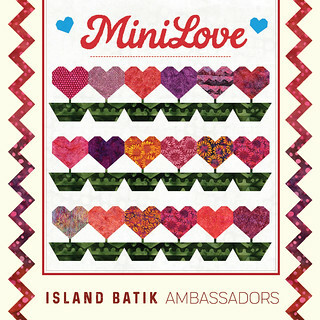 Love your mini. What a beautiful project, love the colors in it! Love it!! I haven't tried much improv sewing, so looking forward to being inspired by your projects with the ambassadors this year!!! Beautiful colors, and that thin batting... never seen that before, looks interesting and perfect for summer quilts. I had never seen it either! I've never used a polyester batting, so I'm not sure how it would be for warmth, but it is so thin. Thanks for visiting, Leah. Great finish. Multi-tasking at its best. Awesome that you crossed off three challenges with one project. Yay for three-fers!! 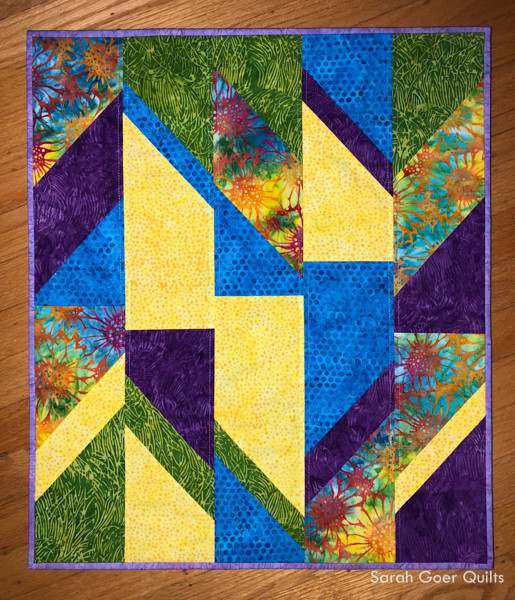 Here's another three-fer for you: your quilt is beautiful, colorful and modern!! Great use of yellow! That batting is way thin. I love thin batting, I will check it out. Thank you, Elizabeth. Let me know what you think of it. Congrats on your ambassador-ship ;) Great quilt! Thanks! Should be a fun year. Thanks for hosting, Kim! I've never seen that batting before. Thank you for highlighting it! 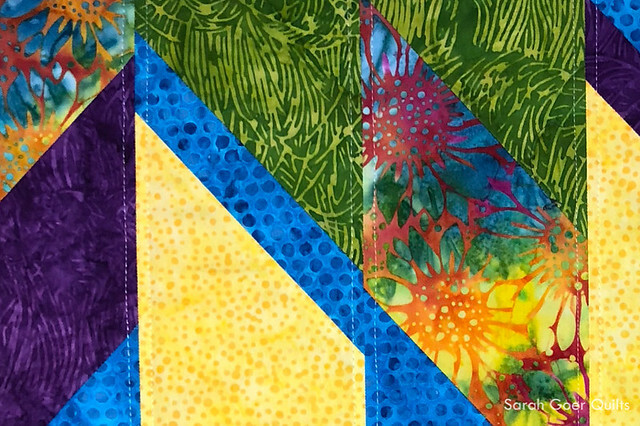 Love your bold abstract mini quilt. :) Great work getting your Island Batik challenge to line up with your teaching commitments.